Confirmed E. coli cases linked to a Connecticut goat dairy more than doubled in the past week as health officials renewed calls for public assistance with their investigation. Of the 34 victims confirmed by the state, 28 are children ranging in age from 10 months to 14 years. Eighteen of them are less than 5 years old. The source of the E. coli O157:H7 outbreak is believed to be Oak Leaf Farm in Lebanon, CT, according to Friday’s outbreak update from the state Department of Public Health (DPH). All but three of the victims visited the goat farm before becoming sick. The three victims who didn’t visit the farm are considered secondary cases because they reported having direct contact with people who visited Oak Leaf Farm. As of midday Friday, nine of the victims have been hospitalized and three have developed hemolytic uremic syndrome (HUS), a rare but serious illness that affects the kidneys and blood clotting system. “DPH continues to monitor for additional reports of secondary cases,” according to an update posted Friday. Oak Leaf Farm produces goat cheese and goat soap, according to its website. Owners, Mark and Jackie Reynolds, have routinely allowed the public to visit the barn and pet the goats. They closed the operation to the public after state officials notified them of the outbreak. 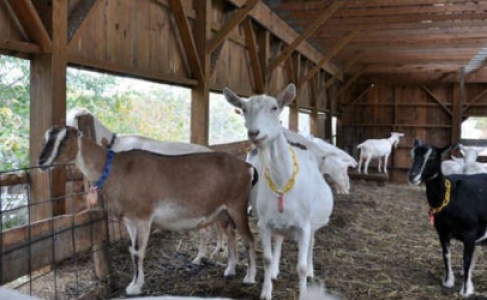 The outbreak was first identified March 24 when six of seven people sickened with E.coli O157:H7 were confirmed by Connecticut’s health department to have recently visited Oak Leaf Farm and come into contact with goats there. Health officials are asking that anyone who has visited the farm recently and developed E. coli infection symptoms to contact the Connecticut Department of Public Health. People who have not become ill but who visited Oak Leaf Farm in March can also assist with the outbreak investigation by contacting the state health department, officials said. Typical symptoms of E. coli infection can include abdominal cramping, watery and frequently bloody diarrhea, vomiting, and a low-grade fever. Symptoms usually resolve over several days, according to the Connecticut DPH. E.coli can easily spread, especially among household members, if proper hand washing is not consistently used. “The best way to prevent the spread of infection is to wash your hands thoroughly after contact with animals and after going to the bathroom and by thoroughly cooking meats and washing fruits and vegetables,” the Connecticut DPH. Numerous phone calls and emails in late March helped health officials identify additional outbreak victims in the past week, state officials reported.